This dainty jacket is very simple to make, being knitted in one piece, without seams. 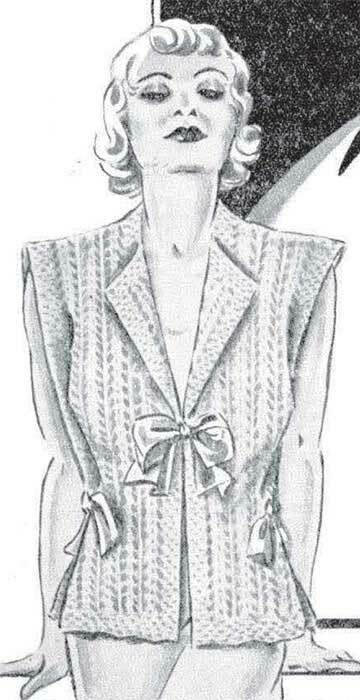 The pattern is intended for a small figure, to enlarge add 11 stitches. Knit the first row into the back of the stitches to obtain a firm edge. 1st row: (K1, p1) 4 times, K1, yo, k2tog, * yo, K3, Slip 1, K2tog, psso, k3, yo, k2; repeat from * 3 times, then yo, k3, slip 1, k2tog, psso, k3, yo, k2tog, yo, k2tog, (p1, k1) 4 times. Repeat the 2nd and 3rd rows until the work measures 16½” from the commencement, ending with the 2nd row. Repeat the 16th and 17th rows for 3 inches, ending with the 16th row. Leave on a spare needle until the left front is worked. Cast on 65sts and work as given for the right front, until the work measures 16½” ending with the the 2nd row. 1st row: (K1, p1) 4 times, k1, yo, k2tog, * yo, k3, slip 1, k2tog, psso, k3, yo, k2; repeat from * once, then yo, p2tog, (k1, p1) 14 times, k1. 2nd row: (K1, p1) 14 times, k1, purl to the last 9sts, (k1, p1) 4 times, k1. Repeat the 1st and 2nd rows 5 times more, then 1st row once. In the next row, cast off 22sts, (p1, k1) 3 times, purl to the last 9sts, (k1, p1) 4 times, k1. Repeat the 15th and 16th rows for 3 inches, ending with the 15th row. Cast on 35sts, then knit in pattern across the stitches of the right front. 2nd row: (K1, p1) 4 times, k1, yo, k2tog, *yo, k3, slip 1, k2tog, psso, k3, yo, k2; repeat from * once, yo, p2tog, (k1, p1) 24 times, K1, p2tog, yo, work in pattern to the end of the row. Repeat 1st and 2nd rows 5 times, then the 1st row once. 15th row: (K1, p1) 4 times, k1, purl to the last 9sts (k1, p1) 4 times, k1. Repeat the 14th and 15th rows for 16½” then work 1½” in moss stitch (US seed stitch). Cast off. Pin out the jacket to shape, making each front 10″ wide and the back 18″; press the pattern part, using a damp cloth and hot iron and avoiding the moss stitch. Tie together at the waist with ribbon and attach a ribbon bow at the end of the rever (that’s the bit tat the front that folds back to make a v-neck). 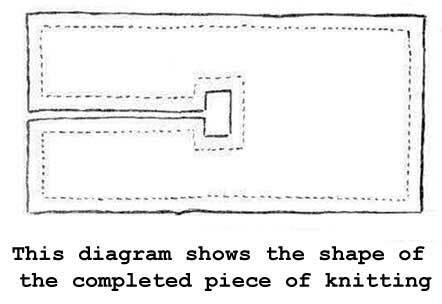 The original publication of this pattern is in the public domain, however the text of this updated version is Copyright Sarah Bradberry, May 24th 2013. All rights reserved.